As their budgets have equalized with those of blockbuster movies, video games have likewise become a notable source of cultural influence. Meme phrases such as “the cake is a lie” (Portal), “war, war never changes” (Fallout), and “I used to be an adventurer like you, then I took an arrow in the knee” (TES5: Skyrim) have become as recognizable as any movie one-liners, at least the Gen X and younger crowd. They produce Culture Points for the countries and factions that they are associated with. Wolfenstein and Far Cry have joined the neoliberalism.txt culture war against Trumpism. Minecraft can be considered a digital complement to the Scandinavian world penchant for blocky chick, as expressed in Lego and IKEA. Deus Ex has become to cyberpunk in video games as Neuromancer is to cyberpunk in literature, Ghost in the Shell is to cyberpunk in anime, and Blade Runner is to cyberpunk on the silver screen. One fascinating development in the past decade has been the relative success of Eastern European countries at producing video games. Though Visegrad and the Ukraine are overshadowed by the Anglosphere – Toronto alone probably rivals their entire output – their per capita performance is entirely respectable to that of the rest of Europe. But I wouldn’t say that this was entirely unexpected, because as opposed to movies, it is much easier for video games to enjoy success beyond the cultural space in which they were created. Anglophone culture is globally dominant, and the world’s stock of A-list celebrities is so concentrated in Hollywood that the US rules the roost here almost by default. Mass Effect: Andromeda vs. The Witcher 3. Video games are different. You don’t need celebrity actors – you mainly just need a technically talented programming and design team, some competent (not necessarily brilliant) translators and localizers, and good marketers. Places like Eastern Europe can be highly competitive, since they have high human capital at highly competitive wages, and don’t have to bow down to SJW ideology like Western media companies, which annoys most gamers. Most of Eastern Europe except Russia, anyhow, which curiously seems to be underrepresented in video game development. GameDevMap is a database of almost 5,000 global video game companies. The United States, as expected, is far in the lead, with 1,525 companies; Canada, France, Germany, Japan, and the UK all have around 200-300 companies. Poland has 94, the Ukraine has 42, and Czechia has 39; Russia has just 73 companies, below Poland in absolute terms, and well below all of them in per capita terms. This quantitative assessment is backed up by qualitative judgments, as I will shortly explain. Poland is a video game powerhouse, home to CD Projekt, the creators of The Witcher series – a more polished and much harder equivalent of The Elder Scrolls (though the latter is legendary for its wealth of mods). With the development of Cyberpunk 2077, they may well ouster the faltering Deus Ex series as the mainstay of cyberpunk in video gaming and come to become Europe’s equivalent of Bethesda, a behemoth that alternates between developing The Elder Scrolls (medieval fantasy) and Fallout (nuclear post-apocalypse). Poland also produced the Dead Island zombie FPS survival series, the Bulletstorm series, and emerging classic This War Of Mine. Czechia also packs an incredibly hard punch for its demographic size. It has created the ARMA tactical FPS series, which is especially noted for its relative military realism. It grew out of Operation Flashpoint, which was released in 2001 and might have been the first Visegrad game to really make a splash. They also developed DayZ, which grew out of an ARMA mod; unfortunately, that project has been a complete failure, becoming a byword for the pitfalls of Steam’s Early Access program. Still, having spent many months in the top seller list, it must have nonetheless made Bohemia Interactive a lot of money. Space Engineers and Medieval Engineers are also both Czech games. I am not familiar with them, though the reviews I’ve read weren’t glowing with praise. However, this doesn’t mean that the Czech video game industry is in the doldrums. Several months ago, new company Warhorse Studio released Kingdom Come: Deliverance, a first person RPG which has become famous for its degree of medieval realism – the architecture is very historically faithful, features the most accurate recreation of medieval swordplay of any major game, and comes accompanied by an in-game encyclopedia so that you actually learn things about medieval Bohemia. One of the more obvious things is that there weren’t any Negroes in that region in the 15th century. 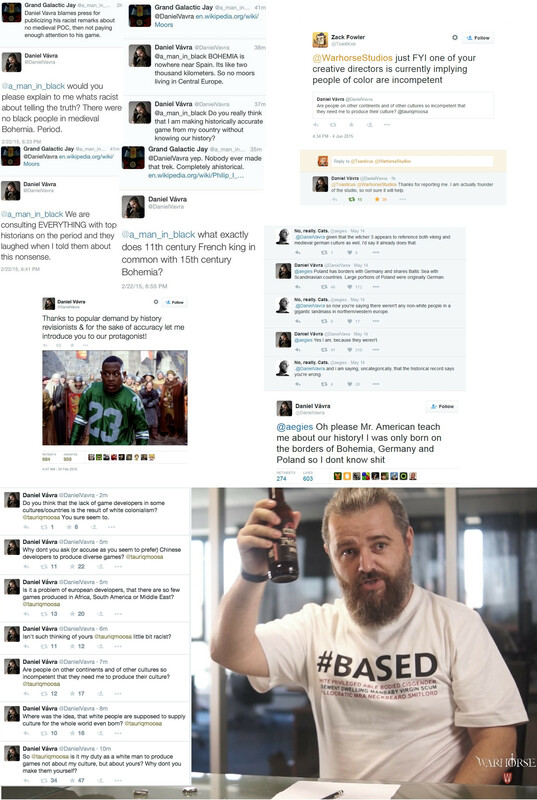 Chief developer Daniel Vavra’s resistance to SJW demands to “diversify” medieval Bohemia provoked leftist attempts to boycott the game; the happy reality is that it has sold very well and is becoming a classic in the genre. Stalker and Metro 2033 are both made by Ukrainian companies. Funnily enough, both are based on originally Russian cultural products – the Strugatsky brothers and Dmitry Glukhovsky, respectively. In a curious analogy, both the Strugatskys and Glukhovsky were/are dissidents against their surrounding culture – the “Land of the Unknown Fathers” in The Inhabited Island was too obviously a satire on the USSR to be unintentional, while Glukhovsky has come out as strongly pro-Ukrainian since 2014, to the extent of ruining the final book in his Metro trilogy with heavy-handed political commentary. Another great Ukrainian success was Cossacks, which might have been the first real time strategy game to feature hundreds of units operating smoothly on standard PCs – a stark contrast to Age of Empires II, which could support a maximum of no more than 125 units on the computers at that time without lagging. World of Tanks, one of the world’s most popular military simulators, was developed in Belorussia. Finally, I must commend the Turks for creating Mount & Blade: Warband, the best video game ever created. I hope they release Mount & Blade: Bannerlord sometime this century. As for Russia… well, it’s been underperforming ever since Tetris, created by a Russian, with 90%+ of profits accruing to a Japanese corporation thanks to the USSR’s complete inability to commercialize anything. For whatever reason, the only sustained success Russia has had in video games seems to be in air combat simulators: The Su-27 Flanker and Il-2 Sturmovik were some of the best in the genre, and the tradition continues with War Thunder. Otherwise, the only game that comes to mind is Pathologic, which is extremely niche, even if it has become a cult classic(perhaps Pathologic 2, currently in development, will draw a bigger player base).Escape from Tarkov, a gritty multiplayer FPS, also seems promising. Nonetheless, all post-Tetris Russian games combined don’t add up to the individual cultural impact of just Stalker, The Witcher, or even World of Tanks. I don’t think it’s brain drain, as commenter Daniel Chieh suggests. This should be even truer for East Europeans (Poles, Czechs, now even Ukrainians) who have access to Western labor markets – but as per above, all of those places are extremely productive. And it’s not a big deal for IT anyway. There’s plenty of IT jobs where you can earn Western salaries doing projects remotely while enjoying East European living costs. I know a few such people in Moscow alone. It is because Russia is too underdeveloped? Well, if the Ukraine can create high-end video games – with a market that’s ten times smaller and an even worse business climate – then Russia certainly should be able to. Moreover, I have a theory that certain forms of backwardness – specifically those characterized by high average IQ coupled with bad institutions, instability, and a surfeit of roving bandits – should actually be GOOD for video games. In such an environment, there will be few people willing to built anything substantial like a multi-billion dollar factory (hence why Ukrainian heavy industry continues to coast on the ever depreciating Soviet legacy). But how much capital do you need to launch a middle-sized video game studio? Can’t imagine it’s much more than $100,000. Most of the value is in the brains. And if instability strikes, you just bug out to someplace like Cyprus or Malta (like 4A Games, the makers of the Metro series, did in 2014). This would explain the remarkable fact that the Ukraine of all places has had more success with making successful video games than Russia, even to the extent of adopting Russian content, with the occasional amusing Ukrainian twist. For instance, in Metro 2033, ROGPR founder Kirill Nesterov once drew my attention to the fact that the abandoned stores in post-apocalyptic Moscow had Soviet-style scales (see right) – even though they had long since vanished from Russia’s capital by 2013, which is when the nuclear war is supposed to have begun. We can only assume that such scales survived in the Ukraine for much longer. Unexpectedly, and paradoxically, another explanation might be that Russia is too advanced. Due to its semi-closed IT market, and reasonably large economies of scale, it is the only European nation that has managed to build a comprehensive and at least partially autarkic IT ecosystem of the sort that only fully exists in the United States and China. Unlike Eastern Europe, there are legitimate tech giants in Russia. Yandex is not only Eurasia’s foremost search engine, but also runs its main cartographic resource (Yandex Maps), one of the region’s major payments processors (Yandex Money), and a very competitive taxi service (Yandex Taxi) which it plans to augment with self-driving cars through AI development. Kaspersky is one of the world’s premier anti-virus companies. 1C Company produces the most widely used accounting software in the former USSR. Vkontakte is a full-fledged, if inferior, analogue to Facebook; it is controlled by Mail.ru group, which also owns Qiwi, another major payments processor. These examples can be expanded on at length. 1. I assume that Russia’s own, partially independent IT ecosystem soaks up a much larger share of the local programming talent than is the case in East-Central Europe, where the great bulk of the IT ecosystem is an extension of Silicon Valley. 2. Since Russian non-IT companies are much less integrated into the global economy than East-Central Europe, I assume that its financial, oil & gas, and even defense companies will also soak up a relatively larger share of the local programming talent. 3. Finally, again thanks to Russia’s IT ecosystem being partially separate from the West, there may also be more money to be made making Russian analogues of American apps and platforms. After all, if such apps already exist and are successful, there is a good chance that they would also be successful in Russia, whereas the commercial success of a video game is far less predictable. It is therefore illogical for Russian tech entrepreneurs to go into video games. If these arguments are broadly accurate, then we should not expect a video game renaissance in Russia anytime soon. On the other hand, I suppose it is an adequate price to pay for having one’s own IT ecosystem. I also expect that much the same arguments will apply to China, which has not produced many (any?) video games of note either.